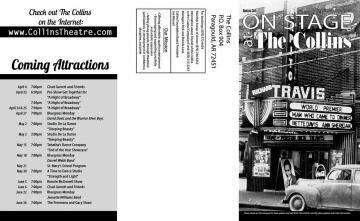 Quarterly Newsletter, Collins Theatre in Paragould, AR. In 2015 the Collins Theatre will celebrate her 90th anniversary. About 35 years ago, she narrowly missed being torn down and turned into a parking lot. Thanks to a handful of concerned individuals, she was rescued, restored, and renovated. She now stands proudly at the corner of 2nd and Emerson, the jewel of downtown Paragould and a tribute to dedicated community support. Various celebrations will take place during the year starting with a Broadway show in March. Musicians, singers and dancers will bring a variety of Broadway numbers to life on stage at the Collins. A special pre-show get together with punch and hors d'oeuvres will be held from 6:30-7:30pm on Thursday night, March 12, with the show starting at 7:30. Tickets for the event will be $25. On Friday and Saturday nights, March 13 and 14, ticket prices will be $12 for adults and $6 for children 12 & under. Season tickets and gold passes cannon be used on Thursday night, but can be used for the Friday and Saturday night performances. We hope to see all of our regular theatre-goers and we'd like to welcome all new-comers. Come and help us open our 2015 season with this 90th celebration event. “A Night on Broadway" will feature a group of exceptionally talented individuals who are waiting to entertain you on these special nights. Scrapbooks and mementos will be displayed in the lobby and a special program booklet will be available. The 5th annual Rockin' the Night Away for the Paragould Band is an action packed, toe-tapping, non-stop fun show for young and old! Take a stroll down memory lane with this variety show, set for two performances – at 7pm on Friday, January 30th and Saturday, January 31st. Listeners will be taken back to the golden age of Rock 'n' Roll of the 50s and early 60s and keep them on the edge of their seats with the Motown and rock sounds of the late 60s, 70s, and chart toppers of the 80's! This one of a kind show spans 40 years of music and will bring together some of northeast Arkansas' top singers, performers and musicians along with guest appearances from members of the award-winning Paragould High School Band program. Singers include Shannon Freeman, Ryan Fisher, Donna Rose, Lori Dial, Derrick Palmer, Tyler Hart and Billy VanDelinder, and singer and master of ceremonies Richie Williams. The sound and lighting will be expertly done by theatre master Jim Kjourlaug and Kent Straub. Special guest appearances will feature selected Paragould Band members, who will be singing, dancing, and playing, will help make this an event LIKE NO OTHER and worth attending! Tickets will be $12 in advance or $15 at the door and all seating is general admission. Donations will also be accepted at the event, with 100% of all the proceeds being applied to help fund transportation. These singers and musicians have traditionally sold out performances at the Collins, so we encourage you to purchase your tickets before the show to ensure you don't miss all the fun. Last year's shows saw nearly a thousand tickets sold. Call Director of Bands Richie Williams at (870) 926-6225 or email rwilliams@paragouldschools.net to reserve your tickets. Tickets will also be available at the Treasure House in the Paragould Plaza. Chad Garrett & Friends will appear at the Collins Theatre in February, April, June, August, October, and December in 2015. The Collins would like to thank Chad for his past and present bookings at the theatre. Plan to attend one or all of Chad's performances this season. He is a wonderful, talented performer with a great band and exceptional guest singers. Keith Allynn has entertained audiences for over 23 years. At the tender age of 14, he began his career in stand-up comedy crowd warming for such acts as Robin Williams, Chris Rock, and Tim Allen. At age 21, he discovered his musical talents performing an Elvis song at karaoke. The crowd went crazy and Keith was hooked! Soon he became an Elvis tribute artist, where he performed and competed as for several years. In 2004 he was voted on by Graceland as being a top 10 Elvis tribute artist in the world. Later wanting to impress a girl who loved Neil Diamond, Keith called her on the phone and in his best Neil Diamond voice, sang her “Hello Again" from “The Jazz Singer." That song became her song. She became his wife and he became The Diamond Image. Diana joins Keith in the show to sing You Don't Bring Me Flowers, Neil Diamond's duet with Barbra Streisand and Neil's third and final number one hit. Experience the feel of Neil in Keith's latest 80 minute non-stop production that tells the story of Neil Diamond's life through Diamond's own songs from 1960 through today. Sing along to favorites like Cherry Cherry, Cracklin' Rosie, America, Song Sung Blue, Sweet Caroline and many more! Keith will perform at the Collins Theatre in Paragould on February 6th at 7:00pm.Tickets are $12 for adults and $6 for children 12 and under. Tickets will be available at the Treasure House in the Paragould Plaza on January 2nd or by calling (870) 573-6454. For $75, you can get a season's ticket good for 10 shows of your choice during 2015.Our gold passes are $200 each or $350 per couple. Gold passes entitle you to all shows for the season, reserved seating, and free concessions. Call 573-6454 or stop by the concession stand.